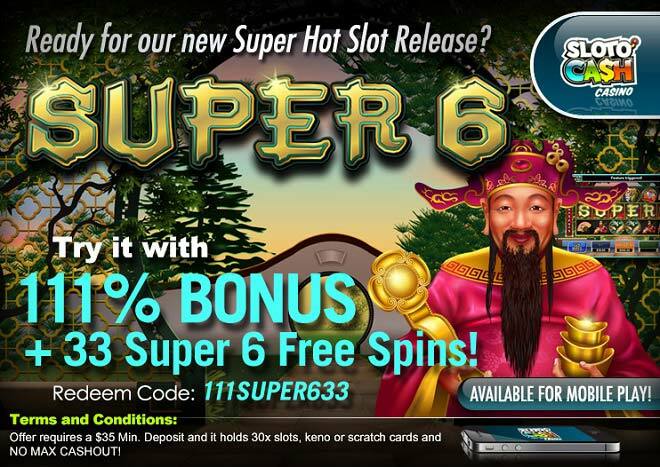 An ancient oriental slot has made it to Sloto’Cash – but it’s not just any slot, it’s Super 6! Discover the many wonders of this luxurious game from your desktop or mobile and deposit as little as $35 to collect a 111% Match plus 33 Super 6 Free Spins! Create your own winning dynasty when you land the Super 6 scatter symbols that help you trigger free spins and other huge bonuses like mega grouped wilds, 5x prize multipliers and an additional wild symbol. Continue playing for doubled prizes and more Chinese fortune! Other symbols include ancient scrolls, Koi fish, lanterns, red envelopes, dragons, and more.